Discussion of mapping to make strategic decisions. Q. How do you gain common understanding of an environment, climate, influence, new business models, technology, etc? Q. 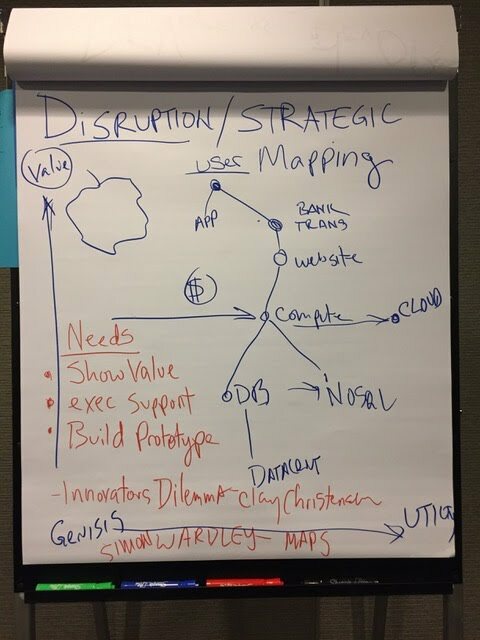 How do you convince executive team to change course or disrupt itself before it becomes irrelevant? A. Show that there is potential value, build prototypes, use leadership, networking, influence, look at previous successes. Q. How do you organize teams to explore and innovate, leverage what works, then optimize/commoditize? A. Recognize that you need distinct teams with different working models, aptitude, criteria for success, speed, etc. - Clayton Christensen - "The Innovator's Dilemma: When New Technologies Cause Great Firms to Fail"